The brass head is non-sparking non-marring and helps absorb blows and reduces rebound. Ideal for driving bushings, bearings, and gears. 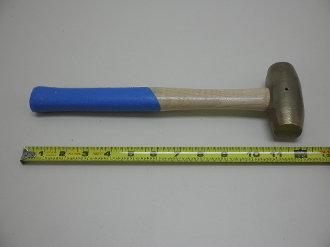 Brass hammers should always be used in the place of steel hammers in any metalworking application that the finish could be damaged by a steel hammer. Non-sparking design is safe to use around fuel lines. Head length/dimensions: 3-1/2" x 1-9/16" dia. Brass is considered to be non-sparking. However, Southern Tool, does not guarantee any hammer to be non-sparking. Hammers can pick up materials during use, like iron or steel, which can be imbedded in the brass and cause sparks.